From the Spanish Inquisition to modern-day mass shootings, history is replete with violent people doing abhorrent things that the rest of us simply can’t imagine as the actions of human beings. Among these men was a serial killer so obscured by the lens of history that he’s almost a ghost. Little is known about Karl Denke, a dark figure shrouded in mystery. We don’t know much about his murders, the events in his house of horrors, or his modus operandi. But we are aware that this brutal man killed and cannibalized dozens of travelers and vagrants in the early 1900s. Perhaps this lack of concrete facts is why Denke has been banished to the recesses of history, although his crimes deserve more thorough scrutiny. Based on the information we have, let’s take a look at one of the most bizarre serial killers in history. His childhood years were particularly dark—not in the sense of homicide and bloodshed but in a lack of what we actually do know about Denke’s youth. Born in 1860 in the Kingdom of Prussia, which is now a part of Poland, Karl Denke was the first of the modern serial killers. He came long before the rise of Ted Bundy and Jeffrey Dahmer. Denke’s family owned their own farm. They were relatively financially secure, unlike Peter Kurten who came from abject poverty and killed around the same time in Germany. Back then, wealth automatically translated into positive character traits and personal pedigree in the eyes of the general public. Many serial killers display behavioral problems at an early age, usually starting around puberty. The case of Karl Denke was no different. He was said to be soft-spoken but a problematic child. At age 12, he ran away from home. If true, however, preteens and teens found to possess all three traits have a much higher likelihood of becoming violent. Around these ages, behavioral problems that suggest psychopathy are often discovered. Denke was a shy boy who had behavioral problems that caused him to run away from home. But we don’t know if he fit the profile of the Macdonald triad. Even so, we’re left to wonder if his behavioral problems would have caught the attention of a modern-day diagnostician. Maybe such a person would have been able to predict Denke’s murderous future. After Denke left home, he became an apprentice to a gardener and began to do landscaping. However, when Denke was 25, his father died and left him a portion of the old farm as an inheritance. Denke tried to farm. But he was never successful with either farming or gardening. So he sold his plot and bought a house to rent out as a landlord. The house had several tenants and many travelers passing through. This made it the perfect place to murder many people over a long stretch of time undetected. However, Denke lived in a small town with a population of 8,000, hardly what we would call urban. The townspeople referred to Denke as “Papa,” “Vater,” or other nicknames that suggested he was a father figure. This stemmed from his willingness to allow strangers and the homeless to stay in his house for free. As an adult, he was known as a generous man. Denke did this for deeply religious reasons, which makes his murders that much more disturbing. But the religious undertones don’t stop there. Denke was an extremely active member of the local church who even played the organ for services. Many serial killers are directly driven by religion, as in the case of Peter Sutcliffe (aka “the Yorkshire Ripper”). Others find themselves deeply nested in their local churches and communities, leading double lives as religious believers and murderous monsters. This was a trait shared by Dennis Rader (aka “the BTK Killer”), David Berkowitz (aka the “Son of Sam”), and even Jeffrey Dahmer (aka “the Milwaukee Cannibal”). Although no one knows if any external influences caused Denke to go on a murder spree that would shock his small town, something inside him definitely snapped. His story seems to transition from that of a man who was relaxed, joyous, and friendly to a tale of murder and cannibalism. Sources are scarce on the issue, and nobody seems to have the slightest idea why this man completely switched personalities and became a macabre monster. Some have suggested a Jekyll-and-Hyde theory. According to this idea, Denke was two men in one body. Outwardly, he was kind, compassionate, and caring—even bearing the cross during church services. Then he transformed into a terrifying, dark, disturbed monster behind closed doors. However, without the material to critically analyze the case, it’s anyone’s guess as to what his motives truly were. The Internet sure has its suggestions and questions. There is something deeply fascinating about the information we’ve lost, which both makes us slightly horrified at the thought of what we don’t know and extremely curious. In late December 1924, there were only two newspaper articles about The Forgotten Cannibal. The first appeared in Frankenstein-Munsterberger Zeitung. As to the second, Munsterberger Zeitung ran a rather detailed piece about Denke’s cannibalistic behavior. After that, the trail of information went cold. Everyone seemed to forget that it had happened. 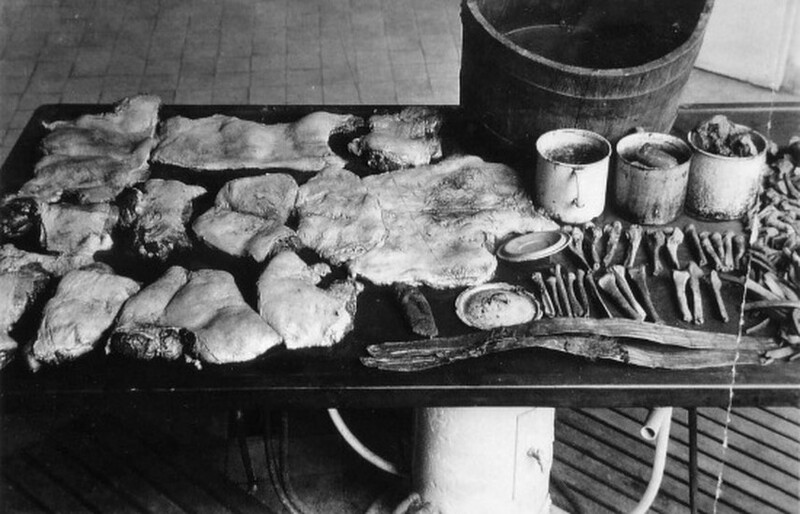 Later, the story was pieced together again by Lucyna Bialy when she presented a report entitled Casus Denke—The Ziebice Cannibal to a scientific conference. Then the trail of documentation grows cold again. Pictures exist of Denke and his grisly crimes, so he was a real person. However, no one knows exactly why his terrifying tale was relegated to the dustbin of history. With crimes so horrific, one would think that Denke would have been fresh on the minds of everyone and that sensational stories would have been republished just for the headlines. Although details are scarce, Denke’s first murder probably took place in 1909 when he killed 25-year-old Emma Sander. If this is the case, Denke enjoyed a 15-year killing spree, claiming at least 30 lives. Fast-forward to December 21, 1924. Denke took in vagabond Vincenz Oliver who had little, if any, money. Later, Oliver showed up at the police station covered in blood. He had been attacked with an axe and told the police that the culprit was none other than Karl Denke. The police laughed at him because Denke had a solid reputation as a stand-up, decent citizen in a small town. To accuse Denke of such behavior was absurd, bordering on unthinkable. But Oliver persisted, and the police questioned Denke. He said that Oliver had tried to rob him, and Denke had lashed out in self-defense. Nonetheless, the police arrested Denke, took him to jail, and placed him in his cell. Later, he was found hanged to death. Denke had committed suicide. Police investigated Denke’s home and uncovered a true house of horrors that would rival other killers’ lairs. The officers found carved-up human meat, a shed of human bones and body parts, and even a wooden barrel with a salt mixture for disposing of corpses. This was somewhat similar to the infamous blue barrels retrieved from Jeffrey Dahmer’s apartment which were filled with hydrochloric acid for disposing of human bodies. Denke’s setup was elaborate. Police found shoelaces made of human skin from the cannibal’s victims. The officers also uncovered belts, suspenders, and a plethora of other items created from human skin. Years later, DNA tests on some preserved specimens confirmed that the flesh was genuine human meat. According to estimates, 30–40 victims were present. Police found 16 femurs, five first ribs, and over 150 pieces of ribs. They also discovered hundreds of foot, ankle, and arm bones. Very few, if any, serial killers care for the objects of their depravity. However, Denke wasn’t a run-of-the-mill cannibal. He cooked his victims and then fed the small town what he called “pork.” It was actually human meat, but no one noticed. Allegedly, Denke sold the flesh of his victims for a profit. This isn’t an unheard-of development as a more modern serial killer, Robert Pickton (aka “The Pig Farmer Killer”), served dead bodies to the local police before his capture, arrest, and subsequent confession. In addition, World War I was particularly brutal on Europe economically and people did what was necessary to survive. I like to write about dark stuff, horror, philosophy, and history. For more dark facts about human cannibals, check out 10 Dark Facts About Issei Sagawa, The Japanese Celebrity Cannibal and 10 Ravenous Cannibal Serial Killers.